This month, Heather requested Granny Squares for the Hope circle of Do. Good Stitches. 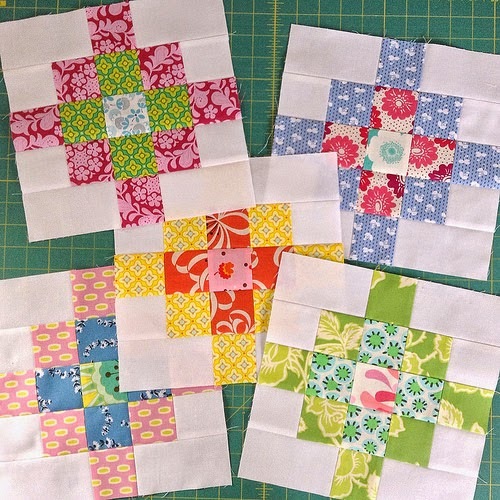 Following the tutorial at Blue Elephant Stitches, I created these colorful blocks. They are usually squared up at this point, but Heather requested that we send them untrimmed. She created a Pinterest board to help us get the idea. You can check out the rest of the blocks the Hope circle created on Flickr. Jessica of Twin Fibers created lovely blocks that are set at a different angle, which eliminates the need to square up blocks after construction. If you're interested in a Granny Square quilt of your own, I highly recommend Lorna McMahon's (Sew Fresh Quilts) thorough tutorial that covers a variety of layout and piecing options. If you really get into the spirit, join the Great Granny Along hosted by Bee in My bonnet. Granny Squares are cropping up all over the place; Moda Bake Shop even has a post featuring this popular block. Have you created any Granny Squares? If not, are you thinking about giving them a try? 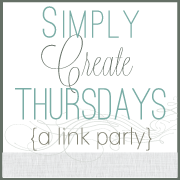 I'm linking up with the parties on my linky page. I want to especially thank Stephanie at Simply Dream & Create for featuring me. You may be familiar with the online learning platform, Craftsy. However, did you know that Craftsy also allows you to sell patterns in their online pattern store without charging a commission on your sales or a monthly fee? 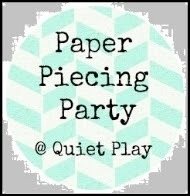 I've listed some free pdf patterns at my Quilting Mod Craftsy Store. 1. Make sure you have a Paypal account. All pattern transactions happen through Paypal, and Craftsy requires that you have an account in order to sell patterns. 2. Put your pattern in .pdf format. You can’t upload any patterns to the online pattern store unless they’re a .pdf file format, so if they’re in a different file format, you must convert it to a .pdf before you upload it to Craftsy. 3. Include a photo. All patterns must have at least one photo to accompany them, but you can add up to five photos. 4. Fill out the pattern description. Make sure you have info about your pattern handy for this step. 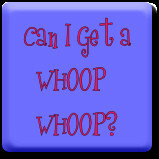 I've join a Round Robin Improv group through the Modern Quilting group on Facebook. For my starter block, I modified a free paper-pieced pattern created by Julianna Gasiorowska for the Warsaw stop of the Big City Girl Quilt Along. You can download the pdf on Craftsy. I have eliminated some pieces and removed the bridge from the background. No offense, but I was only after the mermaid. The pdf includes a 12" and a 16" block option. I found the pieces plentiful enough to justify the larger block size. 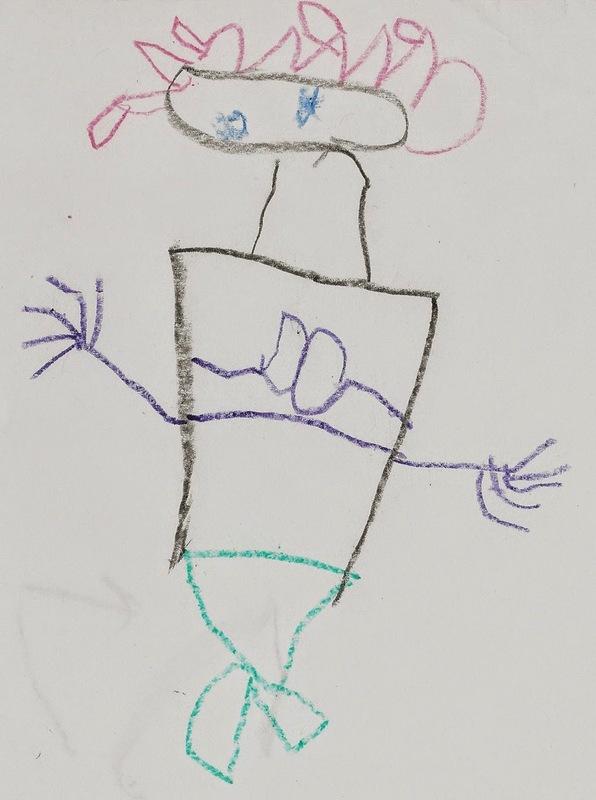 I'm a proud Mama, so I'm giving you a peek at my four-year-old son's rendition of a mermaid. By the way, he's still a little sore with me for not making my mermaid's hair red like Ariel's. Today we're going to machine bind, just in case you wondered how to go about doing that. Measure the perimeter of your quilt. That would be the length plus the width, doubled. Add 15 to this measurement. Take this number and divide by 42". You will need one more strip of binding than the resulting number. (For example, if you ended up with 4.2, you'll need five.) With the fabric still folded like it was when it came off the bolt, cut width of fabric strips (selvage to fold) that measure 2 1/4". Connect these end to end with a 45 degree angle to reduce bulk. Press connecting seams before cutting to 1/4". Spray the wrong side with starch or sizing. Press in half, wrong-sides (non-printed sides) together to make a skinnier strip. I square up my quilt tops before quilting. After quilting, I cut the batting and backing 1/4" larger than the quilt top and as square as possible using a 20 1/2" square ruler for the corners and a 6" x 24" ruler for what remains. I make sure all parts of the quilt top are 1/4" from the edge of the batting or closer. Otherwise, I need to square up small enough to make this occur. If I don't, my binding may not catch the quilt top in this spot and batting will be exposed. The reason I leave the 1/4" of batting extended from the quilt is so that the binding is filled instead of flat and empty. I do clip the corners of the batting outside the 1/4" to remove excess bulk. I begin sewing a 1/4" seam on my least likely to be visible side of the quilt. Leave roughly 10" free and do not backstitch when you start. The raw edge of the binding should line up with the raw edge of the quilt. You can use a walking foot to increase the likelihood of even feeding on top and bottom, so long as you keep a straight 1/4" stitch line. I also wear Machingers gloves to get a better grip during the process. If your machine has needle down, now's the time to employ it. If using a regular presser foot, I adjust my needle position so it is 1/4" from the right edge of my foot so that I can follow the raw edges of the binding with the foot. I continually check with my Add-A-Quarter ruler to make sure the binding is 1/4" from the edge of the batting in case the quilt top wavers a little in its distance from the edge of the batting. When you come to a corner, fold the binding to the right, making a 90 degree angle. If the diagonal angle continued, it should go to the corner of the quilt. Press with your finger. Fold back open. Continue stitching until you get to the fold line. Lift the presser foot with the needle down, pivot, put the foot back down, and stitch following the line diagonally off the binding. Refold the binding. Then, fold it back on itself along the next side. The fold should be even with the raw edge of the binding. The binding should still be 1/4" away from the edge of the batting. Stitching should be 1/2" from the edge of the batting. Starting at the edge of the batting, begin stitching 1/4" away from the raw edges of the binding. I use my seam ripper to make sure the top layer of binding doesn't squirm ahead of the layer touching the quilt top. When you get close to where you started, quit stitching when you have at least 10" of binding hanging lose. Cut off the excess leaving at least a 3" overlap. Open up one end. Fold at a 45 degree angle. Lay the other end inside. Reach inside and pinch the wrong sides of the fabric and pull outward. You should be holding the folded over triangle and the layer of fabric just above it. Pin this in place. Buckle the quilt over onto itself and safety pin so it is no longer pulling the binding tight. Mark the diagonal line. The extra length of binding should be off to your right. Pin on the right and left side of this line. Sew on the line. If you look closely, you can see my orange and green pin heads and how my quilt is folded over to give me room to get the binding into the machine. Lay the quilt out again and inspect to see if the binding lays flat. Repeat the process it is too loose or too tight. If it's just right, press the seam open. Lay the binding back into place. Restarch and press. Sew the remaing length of binding onto the front of the quilt. Then, press the binding away from the quilt top to make it easier to roll to the back. At the corners, fold the binding so the bulk is distributed evenly. Feel with your fingers to see which side is thicker. Make the overlap on the back got on the opposite side of the miter. Lovely (the quilt miter, not my thumb). Make a quilters knot by pinching the eye of the needle between your right forefinger and thumb, wrapping the thread around the needle clockwise from back to front, and pulling the needle through the knot with your left hand. Poke the needle through the batting and the very edge of the binding. Travel through the batting without poking through the quilt top. Come up through the edge of the binding. Go back in just above where you came out (on the backing) and travel through the batting again. Repeat while watching numerous movies. Don't use a thread longer than you arm or it will tangle, knot, and break. Please believe me; I tried, and it wasn't fun. Alternatively, you can machine stitch the back by stitching in the ditch on the top using top thread that blends with the quilt top and thread that matches the binding in the bobbin. I glue down the binding in this case so it doesn't slip out. 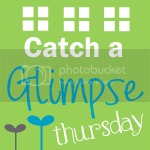 Check out Sharon Schamber's video tutorial for more information. You'll also need glue tips.